Wikia is Growing – Is Anyone Paying Attention? I was going through CEO Gil Penchina’s Wikia presentation slides at the Le Web conference in Paris last month and noticed something that made me realize they could be a huge site some day. According to the company, Wikia is producing 2.5 million page views per day and growing steadily, and their new article growth rate tracks the early days of Wikipedia, nearly identically. 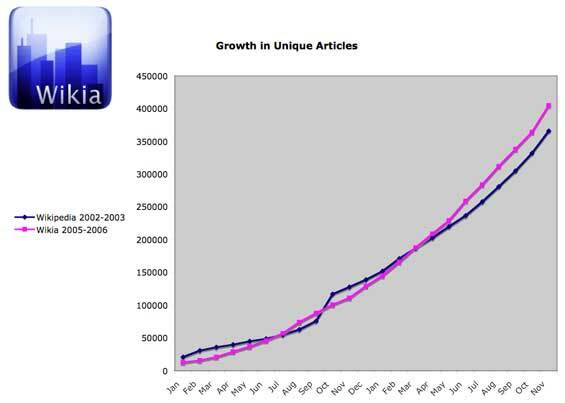 The key slide from Penchina’s presentation is below, comparing growth in unique articles between the two sites, but over different time periods. It’s harder to compare page views as Wikipedia has apparently not tracked their own page views for years, but Wikia is certainly holding their own at 2.5 million/day. Wikia confirms that they currently have nothing more than a “default” deal with Google for text ads on their site. The big ad networks (Google, Yahoo, Microsoft) are all trying lock up long term deals with big partners, usually by offering some sort of revenue guarantee (see Google’s nearly $1 billion deal with MySpace and Microsoft’s deal with Facebook). I wouldn’t be surprised to see each of them begin to pursue Wikia as well, simply as a hedge in the event the site someday grows to even a fraction of Wikipedia’s size. Whichever company locks up Wika over the long term may have a very nice asset down the road. Our earlier coverage of Wikia is here.